Claiming the land: a Lock the Gate group in action. What do you get if you combine a rightwing radio ‘shock jock’, conservative farmers and environmental activists? The surprising answer is a loose but effective coalition against fracking for coal seam gas (CSG) in Australia. With more than 437 million hectares of Australian land – an area 18 times the size of Britain – covered by petroleum and gas licences or applications, it’s clear that energy companies are eyeing a big gas payday. Standing in their way is the unlikely alliance of campaigners and community groups concerned about the impact of fracking upon their water – a highly prized resource on the parched continent. Perhaps the most unlikely convert to this environmental cause is Alan Jones, a radio host who once said he wanted to put former prime minister Julia Gillard ‘into a chaff bag’ and throw her out to sea. He has also called the science of climate change a ‘hoax’ and ‘witchcraft’. But, recently, Jones has been aiming his fire squarely at the fracking industry, using language that wouldn’t appear out of place for the Occupy movement. He has accused political parties of being in bed with large resource companies to crush ordinary people in order to expand fracking, which he calls ‘the asbestos of tomorrow’. He told a rally in August that pro-mining proposals put forward by the government ‘would be acceptable legislation drafted by Vladimir Putin, but not here in New South Wales’. While Jones has provided the populist hyperbole, the heartbeat of the anti-fracking movement is the Lock the Gate Alliance, a network of community activists and environmentalists who support farmers’ rights to prevent entry of fracking companies on to their land. Anti-fracking rallies have been held across the country, including a co-ordinated stunt where thousands of protesters spelt out the words ‘No CSG’ on several New South Wales beaches. 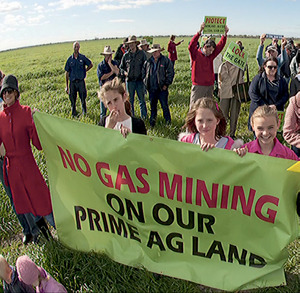 Lock the Gate has also supported symbolic blockades of farms to keep out resources firms, with Drew Hutton, the co-founder of the Australian Greens, arrested as a result of an action. ‘On one farm just north of Emerald, the mining company said that the farmer would lose two metres in depth from his water bore by 2020, but the actual drawdown has been five metres already. So far this motley opposition has wrested a promise from the federal government to ensure all new developments that may impact the water table are assessed by both state and national governments. Greater success has been achieved in Victoria where overwhelming popular opposition led to a moratorium – but there are fears the government there looks likely to lift it. With a new conservative, seemingly pro-fracking, government in power in Canberra, Lock the Gate and Jones look ready to fire up once again to protect the interests of farmers and rural communities.